The Bosch WTVC553SUC, part of the manufacturer’s 500 series, is one of the most efficient dryers in the market. It is packed with features that help reduce energy use, some through more obvious ways and some through promoting sheer efficiency. Powerfully charged but energy efficient and feature-packed but operates in relative quiet, the WTVC553SUC is full of delightful contradictions. The WTVC553SUC is Energy Star compliant. In fact, BOSCH has become the Energy Partner of the Year in 2009. This particular dryer is backed up with EcoSmart technology, which enables it to be very efficient. The EcoAction Technology it uses helps it in functioning with energy that has been reduced by 10%. With its DynamicAir and ActiveAir features, the WTVC553SUC is able to dry clothes thoroughly without having to use too much heat. These features are applicable to any type of fabric. The dryer also comes with a cycle that does not use heat at all: the Air Fluff/No Heat drying cycle. Still, it comes with sensors that prevent it from overheating. There are drying cycles intended for use on jeans only and on delicates only. The appropriate amount of heat and pressure is applied for each type of fabric. There are even cycles that specialize on removing wrinkles, and even odors. The Steam Touch Up is designed to refresh full loads in a matter of 20 minutes. The WTVC553SUC performs all of its cycles without much noise. 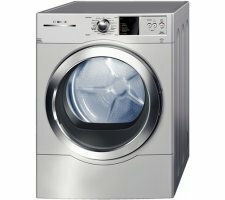 Its Extremely Quiet Performance feature helps it become one of the quietest dryers in America. The use of 3 way venting makes the WTVC553SUC easy to install. The WTVC553SUC come with an LED display for easy checking of status. The display type also makes the dryer modern-looking. An interior light makes it easy to check the insides of the drum. The dryer comes with a white overall finish, for a clean and professional look. The buttons have a silver finish while the dials and the door ring are made of chrome. The door hinge is reversible. The user can open the door easily using his or her right hand. Stackability makes it easy for the WTVC553SUC to be placed on top of or under a washing machine of about the same size. This should help optimize space. With the WTVC553SUC’s energy efficiency, the user is contributing to the conservation of resources, while saving money on electricity bills. In terms of savings, the initial expense of the product is not bad, either. The dryer comes with several cycles that can be used to dry different types of fabric thoroughly but gently. This means you can efficiently dry a variety of fabrics through this machine. It does not have a cycle for wool and other specific fabrics. Plastic surgery is treatment for hide or removing the defects on face like marks of cut,mark of burn ,skin disease and other.Know more about plastic surgery visit above link and groom your beauty. We're the #1 Social media marketing services provider in United Kingdom. Buy Instagram followers cheap, Twitter Followers UK from us. Its good to get information about all type of washing machines. This machine's feature you told in this article are awesome. I recomend you that keep washing machines on rubber flooring areas. Or make your washing machine's areas safe by purchasing cheap rubber floor matting not-slip tiles. This is the actually high-quality blog and primary time I understand writing this blog and truthfully enjoyed a lot and expect you will remain sharing comparable blog like this. buy a research paper clicks to check it out its armed forces. I think this is the really good post and first time I read this blog post and truly enjoyed a lot and hope you will keep sharing similar post like this. Buy Essays Online Uk click to check it out its services. You realize it is very beneficial for me and from many days, i used to be finding this. Recognize i'm very glad to look your put up and respect your work. Only feature which would be a main attraction for me is its energy efficiency mode. Its less noise feature can be the reason of attraction. What kind of detergent is recommend for heavy water or the place where water is not good for clothes? I think essaysenter can help me to gather information about Detergents and Popular washing machine models. Mine had a little gas valve issue a week after purchasing and I posted a horrible review on here about this dryer being a lemon. I take it back. The warrranty service repair business that Bosch told me to use was unprofessional and lead me to believe I had a lemon of a dryer. Once I got a new repair company to take a look, they had it up and running in no time. Good dryer thurs far.